In this class, Wharton professor and tech entrepreneur Kartik Hosanager discusses how artificial intelligence is well on its way to running nearly every aspect of our lives. The technology embedded in web-enabled devices, algorithms, and the programs that power them, make a staggering number of everyday decisions for us: from what products we buy, to where we decide to eat, to how we consume our news, to whom we date, and how we find a job. We’ve even delegated life-and-death decisions to algorithms; decisions once made by doctors, pilots, and judges. Kartik Hosanagar is a Professor at The Wharton School of the University of Pennsylvania. He has been recognized as one of the world’s top 40 business professors under 40, and has received several teaching awards including the MBA and Undergraduate Excellence in Teaching awards at the Wharton School. His research has received several awards including the best paper award at the Consortium on Technology Policy and Management. Kartik is a cofounder of Yodle Inc, a venture-backed firm that has been listed among the top 50 fastest growing private firms in the US. His past consulting and executive education clients include Google, Nokia, American Express, Citi and others. 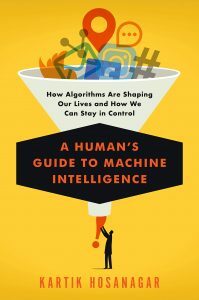 Students who attend this class will also receive a free copy of Kartik’s brand new book “A Human’s Guide to Machine Intelligence.” He will be available after the talk for a book signing.